The Pilot Proficiency Center at Airventure is an assembly of best in class flight training tools and instructors dedicated to pilot proficiency and safety. 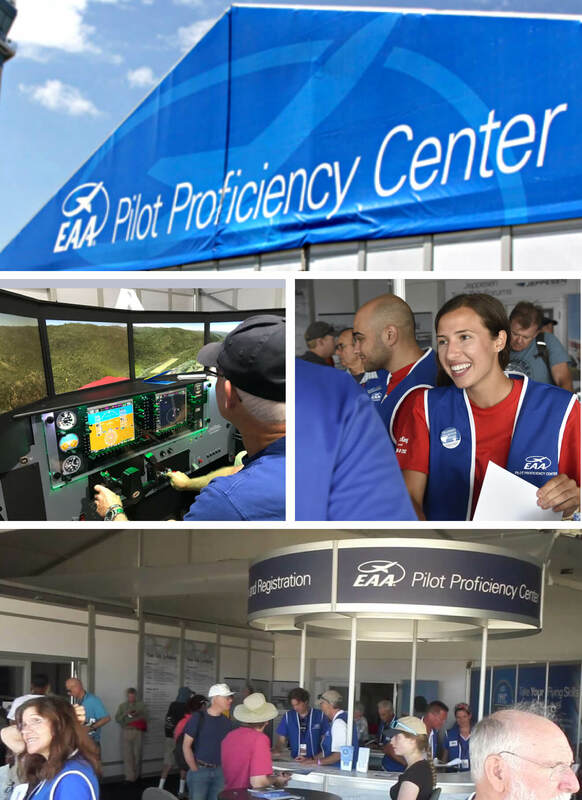 The EAA Pilot Proficiency Center (PPC) is a skill building and training center for pilots at AirVenture. It's purpose is to combine relevant safety forums with challenging simulator training sessions that address key safety of flight issues and to also make pilots aware of the enormous benefit of flight simulation devices for proficiency training at home. Centrally located on the Four Corners at EAA AirVenture Oshkosh, the PPC features fourteen advanced aviation training devices with an extensive offering of simulation scenarios and exercises focused on such areas as loss of control, crosswind landings, IFR approaches and decision making. All sessions include comprehensive flight evaluation and debriefing opportunities that suggest areas of concentration for further training back home and throughout the flying season. The EAA Pilot Proficiency Center also features a full schedule of Tech Talks with topics sure to interest pilots of all types, skill level, and experience. If you're a CFI and would like to learn more about opportunities to instruct at the PPC venue at Oshkosh this July, please follow this link: Instruct at AirVenture '18. Choose from an array of Tech Talks, Webinars and Forums covering a variety of subjects and featuring subject matter experts. Choose from over 30 professionally produced simulation missions including Exercises designed to focus on specific elements of flight such as instrument approaches or crosswind landings; Scenarios, where you are pilot in command of the mission from beginning to end, and Competency Bundles which are subject-specific mission combinations. The hub for an overview of the Pilot Proficiency Center, mission lesson plans and an orientation of the flight training tools and services at your disposal. Flight instructors only please. Don’t wait for Oshkosh 2019 to start training. The Pilot Proficiency Center program can now be accessed year round. Use our locator app to find a location near you. Whether you’ve the good fortune of attending the PPC at EAA AirVenture at this year or not we want you to be a proficient and safe pilot. We’re creating a flight training network so that pilots can have access to the same resources we’ve assembled at Oshkosh. Help us build it by letting us know you want this program in your community.